Erythema infectiosum: "slapped cheek" rash in a child. Aplastic crisis in patients with chronic hemolytic anemia or AIDS. Giant pronormoblasts seen in bone marrow. Specific antibody (immunoglobulin G [IgG] and IgM), although these may not develop in certain immunocompromised patients. Detection of specific nucleic acids (eg, by polymerase chain reaction [PCR] assay) or antigens in blood. 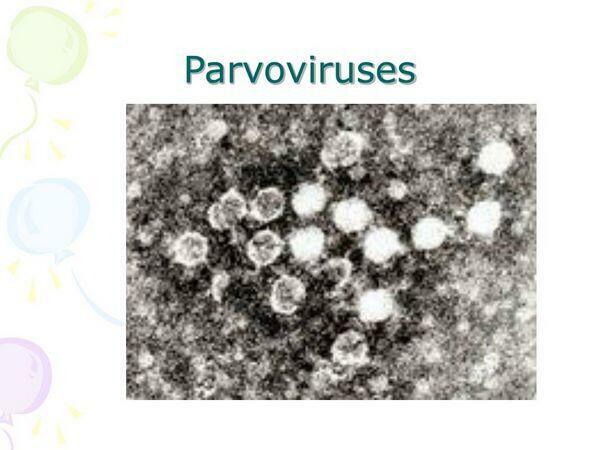 Parvoviruses are widespread bird and mammalian viruses. 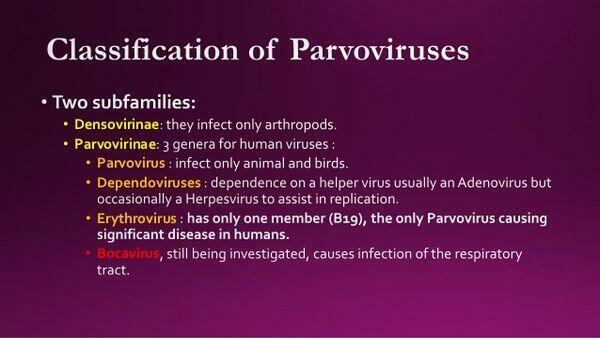 More than 50 types have been identified, but the most common identified human pathogen is parvovirus B19. It is the cause of erythema infectiosum (Fifth disease) and is responsible for episodes of aplastic crises in patients with chronic anemia, especially those with hemolytic anemia and AIDS (Box 1). B19 is also associated with arthritis and intrauterine infection. Up to 90% of the adult population have antibodies to B19. 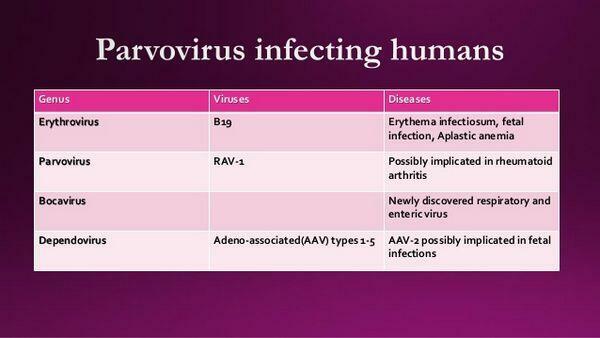 Most infections with this virus occur by 40 years of age. As many as 25% of these infections are asymptomatic and one half are unaccompanied by a rash. Erythema infectiosum is most common in children from ages 4 to 15 years, and it tends to occur in winter and spring. The route of natural transmission is presumably by respiratory droplets. Parenteral transmission of B19 has been described. B19 virus is an extremely small (18- to 26-nm diameter), nonenveloped, icosahedral virion. The B19 virus genome contains one linear single-stranded DNA molecule with a molecular weight of 1.5-1.8 × 106 (5.5 kb in length). The viral genome codes for three structural and one nonstructural protein. The replicative cycle includes infection of mitotically active cells such as erythroid precursor cells. The receptor molecule for B19 is a glycolipid antigen on the surface of erythrocytes. Transcription, replication, and assembly occur in the host cell nucleus. Steps in DNA replication most likely require host cell functions present only in the late "S" phase, necessitating a mitotically active host cell. Intranasal inoculation of volunteers with B19 virus suggests that the virus first replicates in the upper respiratory tract, followed by viremia and replication in erythroid precursor cells in the bone marrow. This replication inhibits proliferation of precursor erythrocytes. Infection of a normal host may result in mild nonspecific symptoms such as sore throat, malaise, and myalgia, and a slight drop in hemoglobin. Infection of hosts with chronic hemolytic anemia (eg, sickle cell anemia) may result in life-threatening reticulocytopenia, referred to as aplastic crisis. The initial course of B19 virus infection in healthy children includes the symptoms just described, resulting from lytic virus infection, and a noninfectious, immunologic phase approximately 2-3 weeks after initial infection. The immunologic phase, which includes rash and arthralgia, is termed erythema infectiosum and appears to be immune mediated, since symptoms accompany the appearance of virus-specific IgM and circulating immune complexes. Antibody produced during infection presumably confers life-long immunity. Erythema infectiosum (Fifth disease) begins with a distinctive rash on the face resembling a cheek that has been slapped. The rash then usually spreads, especially to exposed skin such as the arms and legs, and then subsides over a 1-2 week period. Relapse of the rash may occur often. In adults, arthritis of hands, wrists, knees, and ankles predominates, and the rash often does not occur or it may precede the arthritis. There are no distinctive blood abnormalities in patients with erythema infectiosum. In patients with aplastic crisis, there is profound anemia with no reticulocytosis. The most serious complication of parvovirus infection is the aplastic crisis that occurs in patients with chronic anemia, including those with human immunodeficiency viral infection who cannot control viral replication. Aplastic crisis is accompanied by fever and nonspecific symptoms of malaise, myalgia, chills, and itching. Parvovirus infection in these patients may be associated with maculopapular rash with arthralgia and some joint swelling. The infection is characterized by transient reduction of erythropoiesis in the bone marrow and results in a transient reticulocytopenia (7-10 days) and a decrease in hemoglobin levels. In AIDS or immunocompromised patients, these abnormalities may persist, constantly or intermittently, for months to years. In addition to chronic marrow suppression, mentioned above, B19 infection is also associated with fetal infection and stillbirth, although infection of pregnant women may occur without any adverse effect on the fetus. However, there is no evidence that B19 causes congenital abnormalities. B19 virus is not recovered in tissue culture but can be directly detected in serum or throat washes during the prodromal period or aplastic crisis by enzyme and radioimmunoassay, nucleic acid hybridization, and immune electron microscopy. PCR is a very sensitive method for detecting B19 but may remain positive for months after B19 infection. The presence of characteristic "giant" pronormoblasts in bone marrow may provide a clue to parvovirus as the cause of an aplastic crisis. More readily available and applicable to patients with erythema infectiosum and aplastic crisis is the virus-specific IgM test, which indicates current or recent infection. This test is not useful in AIDS patients because they do not mount an IgM antibody response. No specific antiviral treatment is known, but chronic B19-induced anemia may be treatable with immune globulin. B19 infection can be chronic in immunocompromised patients, with intermittent worsening of anemia for months to years. Control of respiratory spread could decrease transmission of B19 virus; however, patients with clinically apparent erythema infectiosum are no longer infectious. Transmission therefore would occur before preventive measures (eg, isolation) are enacted (Box 2). Presumed respiratory transmission but most contagious in the preclinical stage.